Loaded with antioxidants, blueberries boast greater health benefits than many other fruits including oranges, cherries, grapes and bananas. Studies about blueberries have shown positive neurological results such as improved motor skills and decreased short-term memory loss. No wonder they have been coined “brain berries!” As one of the best sources of antioxidants, this low-calorie fruit packs a long list of nutrients including potassium, iron and fiber. 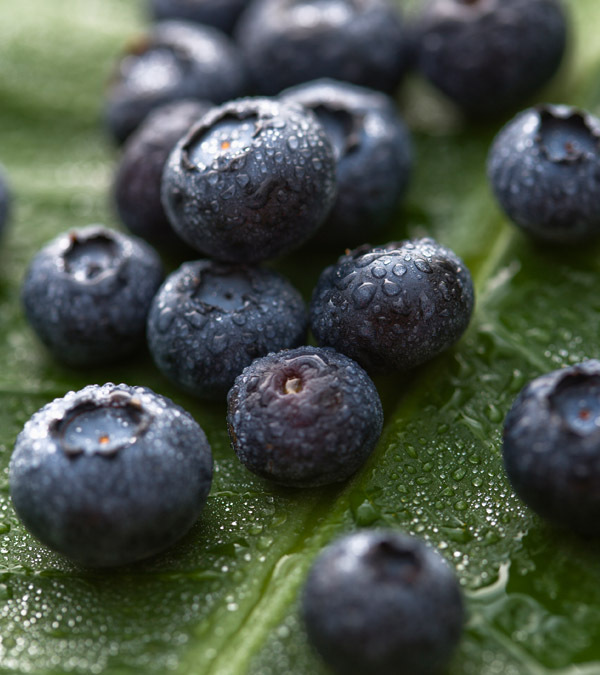 Add this blue super food to your daily diet and reap the benefits of this tasty berry. When choosing this powerful produce, select berries that are firm, uniform in shape and free from a lot of stems or leaves. Since color, rather than size, is the best indicator of flavor, look for purplish-blue or bluish-black berries – avoid berries that have a reddish hue. To prevent bruising and prolong storage life, blueberries should be stored in a single layer on a rimmed baking pan covered with paper towels; refrigerate up to two weeks. Also, they should not be washed until just before use since the silver-frosted coating acts as a natural protectant. To freeze blueberries, place a large zip-tight, freezer-safe plastic bag on a baking pan and place a single layer of berries in the bag. Leave the bag open and freeze. Once frozen, seal and return the bag to the freezer for up to nine months. Though blueberries tend to lose their pigment after freezing, the flavor will not be compromised. Add these tiny, flavor-packed berries to yogurt, smoothies, baked goods, pancakes, salads and desserts. When using frozen berries, do not thaw them before adding to batters to prevent bleeding.